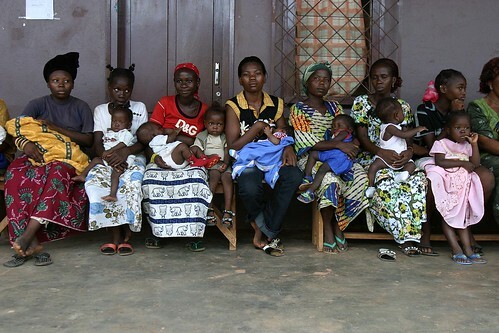 Mothers and babies aged between 0 and 5 years are lining up in a Health Post at Begoua, a district of the Central African Republic’s capital Bangui, waiting for the two drops of the oral polio vaccine that will prevent paralysis and death, 15 May 2008. UNICEF Goodwill Ambassador Mia Farrow launched the 3-day polio vaccination campaign at the start of her visit to CAR. Despite the progress over the past few years, medical care remains both costly and inaccessible for many families across CAR. Despite tremendous progress, vaccination coverage for preventable diseases stands at less than 50% and one child in five does not live to celebrate his or her fifth birthday.